Application: X-Y Robot screw driving station accepts conveyor pallets, lift & locates, drives fasteners in multiple locations. Line PLC handshaking. 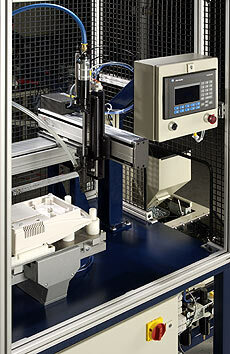 Automatic screw feeding and driving equipment from Visumatic is tailored to meet your specific assembly needs. This XY robot fully automated conveyor line station was designed and built to drop into and existing assembly line. Robotic screw driving added extreme flexibility through automation to this multiple component product line. to your existing assembly conveyor system. Extreme Flexibility. Tremendous Accuracy. Easy Implementation. Locates conveyor pallets. XY robot drives multiple screw locations, allows for an operator & part bins in this turnkey cell. Two XY robot assembly stations that simultaneously drive screws into multiple parts with automatic part eject.